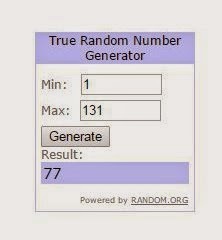 GBSB Fashion With Fabric Giveaway Winner Announced! A little bit later than expected, but I'm delighted to finally pop in and announce the winner The Great British Sewing Bee Fashion with Fabric, which I reviewed here. ...Annie of Left on the Shelf! Congratulations Annie!!! I've emailed you for your address so that the lovely people at Quadrille can post your copy out to you asap. How wonderful. Thank you so much for running this giveaway. I have sent a PM with my details.